First, I know what you're thinking - super creepy, right? Last night I completed the thermoformable and leather mask that I have been working on recently. I'm happy with the way that it turned out. This was a difficult process. The thermoformable is a plastic with holes in it that can be pulled over a surface when heated. That part was easy and fun. Covering the mask with leather proved a little more challenging. I had trouble pulling the leather into these complex shapes without tons of wrinkling. Eventually I created hidden seams at the sides of the nose. This seemed like an excellent way to deal with the extra fullness that needed to be removed form the mask. The leather was then glued to the thermoformable with barge cement. The mask was lined with black felt. 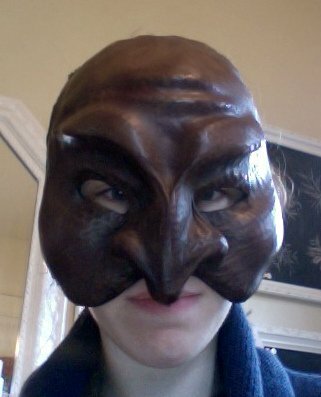 Then the entire mask was dyed using leather dyes. Finally, the leather was polished with shoe polish to give it some dimension and an aged look.